In sports everyone's a winner, some win better than others. Like the marketing geniuses who quickly pulled together $12 burger platters named after Stephen Strasburg, welcoming the goofy-grinned savior to both Major League Baseball and DC-area stomachs. Fawning adulation was not in short supply, as evidenced by all those sportswriters who turned Strasburg into Roy Hobbs 2.0 soon after he fanned his third Pittsburgh batter, But the burgers, oh, the burgers. 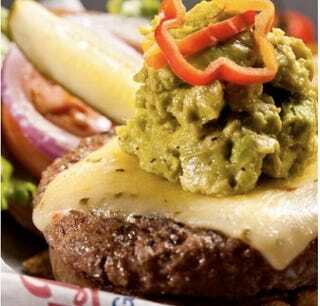 There's this Strasburger that "brings the heat" with the spicy red pepper at Glory Days. Then there's the one at Tortilla Coast topped with a sticky honey glaze and selling for $11.37 — the "37" either represents the number on the back of Strasburg's jersey or the one on the back of Cool Hand Luke's prison blues. Both are honey-glazed saviors, in their own way. This hot dog atop a burger smothered in aged Vermont cheddar pays homage to Strasburger's fine beginnings as he climbs up the ranks to baseball stardom. The hot dog, symbolizing his professional debut on the Phoenix Desert Dogs in 2009, will be topped with "Syracuse Orange" aged Vermont cheddar, representing his promotion to the Triple A- Syracuse Chiefs in May 2010, and placed on top of the iconic BGR burger patty, signifying his current home on the Nationals. BGR will add a pickle for every strike out Strasburg throws at his debut game tonight. The Strasburger will be available through the end of June. So, that's right — there will be 14 pickles with this burger.